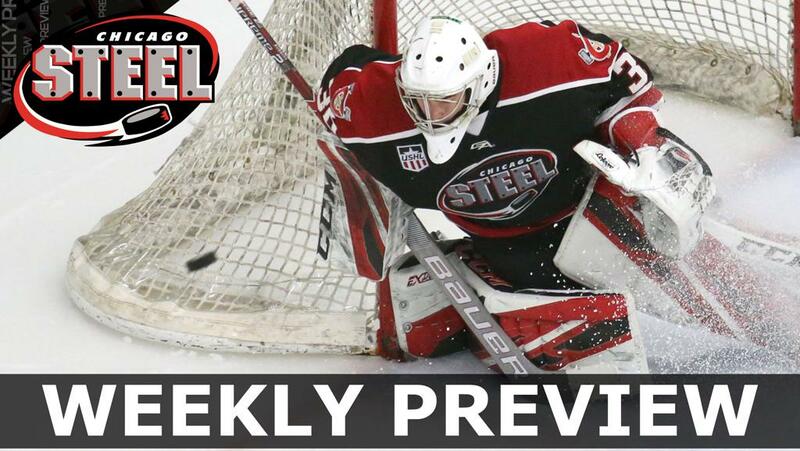 GENEVA, ILLINOIS — The Chicago Steel hit the road this weekend for their only regular season road meetings with the Sioux Falls Stampede (Friday) and Sioux City Musketeers (Saturday). Chicago (25-13-1-0, 51 pts.) enters the weekend having won eight of its last nine games and its last four matchups against Western Conference opponents. Steel center Nick Abruzzese enters the weekend tied for the USHL lead with 49 points (16-33-49) this season. The Harvard University commit has recorded a point in 17 of his last 21 games and has a team-high 15 multi-point games this season. Chicago defenseman Matteo Pietroniro is second among USHL defensemen this season with 33 points and 14 goals. The Steel have been backstopped by goaltender Justin Robbins who enters the weekend on an eight-game win streak including two shutouts during that span. Friday’s 7:05 p.m. matchup at the Denny Sanford Premier Center will be the first meeting of the season between Chicago and Sioux Falls (24-10-3-1, 52 pts.). The Steel enter the weekend second in the Eastern Conference while the Stampede are fourth in the Western Conference having won eight of their last 10 games. Sioux Falls has taken three of the four previous matchups at Denny Sanford Premier Center including the only road matchup of the season last year, a 5-1 Stampede win on March 10, 2018. The Stampede have had a balanced offensive attack this season as three forwards have 30 or more points and 10 skaters have 22-or-more points. Forward Jami Krannila leads Sioux Falls with 32 points (13-19-32) in 37 games this season. Goaltender Alec Calvaruso enters the weekend with the sixth-best goals against average among USHL goaltenders with a 2.61 mark this season. The Livonia, Mich. native has a 11-2-0-0 record in 14 games since joining the team in December. Saturday will mark the final regular season meeting between the Steel and Sioux City Musketeers (19-13-5-1, 44 pts.) after Chicago took the first meeting 5-1 back on January 19 in Geneva. The game was a tight defensive battle for the first period and a half before Abruzzese broke the scoreless tie with about five minutes to play in the second period. The Steel then then exploded for four goals in the third period. Justin Robbins turned away 28 of the 29 shots he faced in the game. The Musketeers will be led offensively by leading scorer Martin Pospisil (12-30-42) who is currently tied for seventh in USHL scoring. Sioux City will also have forward Bobby Brink, who is tied for 14th in the USHL with 37 points (17-20-37) in 21 games this season, back in the lineup after missing the first matchup with Chicago. The University of Denver commit and reigning USHL Offensive Player of the Week was recently rated the 29th best North American skater by NHL Central Scouting for the 2019 NHL Draft. Musketeers goaltender Ben Kraws has played in 32 games this season with a 2.85 goals against average, .898 save percentage and 16-10-4-1 record. The Miami University commit is NHL Central Scouting’s 25th ranked North American goaltender. Chicago returns to Fox Valley Ice Arena for a Friday, Feb. 15 game at 7:05 p.m. against the Muskegon Lumberjacks for Military Appreciation/Hometown Heroes Night. The Steel then host Team USA U18 for a 7:05 p.m. faceoff on Saturday, Feb. 16 for Let it Snow Globe! Snow Globe Giveaway for the first 500 fans in attendance. - Chicago forward Robert Mastrosimone’s between-the-legs goal on Saturday, Feb. 2 was featured on SportsCenter as #5 in the Top 10 Plays. The Boston University commit has 32 points (17-15-32) in 31 games this season as he prepares for the 2019 NHL Draft. NHL Central Scouting has Mastrosimone as #49 among North American skaters for the upcoming draft held in Vancouver in June. - Nick Abruzzese enters the weekend tied for the USHL lead with 49 points (16-33-49) this season. The Harvard University commit has at least one point in 17 of his last 21 games. Abruzzese was also featured on NHL Central Scouting’s latest rankings. - Justin Robbins enters the weekend on an eight-game win streak that includes both of his shutouts this season including this past Saturday’s 4-0 victory over Youngstown. - Matteo Pietroniro is currently second among USHL defensemen for both points (33) and goals (14). - Forward Gunnarwolfe Fontaine is on a seven-game point streak and has points in eight of his last nine (9-3-12). Fontaine has three goals in the last two games. - Forward Josiah Slavin has points in three of four games with the Steel this season. The Chicago Blackhawks prospect has five points (3-2-5) with the Steel, who are 3-1-0-0 since his arrival. - Defenseman Jimmy Dowd is on his first point streak of the season as he recorded an assist in each game last weekend. - Chicago travels to Sioux Falls, S.D. for a Friday night matchup with the Stampede at 7:05 p.m. CT.
o Sioux Falls (24-10-3-1, 52 pts.) is currently tied for third in the Western Conference and enters the weekend as winners of eight of their last 10 games including the last three. o Forward Jami Krannila leads the Stampede with 32 points (13-19-32) this season. He enters Friday’s matchup on a three-game point streak (1-4-5). o Goaltender Alec Calvaruso has an 11-2-0-0 record since joining Sioux Falls in December. He has a 2.61 goals against average and .889 save percentage this season. - The Steel then travel to Sioux City, Iowa for a Saturday night game against the Musketeers at 7:05 p.m. CT.
o Sioux City (19-13-5-1, 44 pts.) is tied for fifth in the Western Conference but is looking to reverse the tide after losing four of the last five games. o Forward Martin Pospisil leads the Musketeers with 42 points (12-30-42) in 32 games this season. o Goaltender Ben Kraws has appeared in 32 games this season and holds a 16-10-4-1 record with a 2.85 goals against average and .898 save percentage. The Miami University commit is looking for his first win since January 18 as he has a 3.21 goals against average and .882 save percentage over the last four games (0-3-0-1).